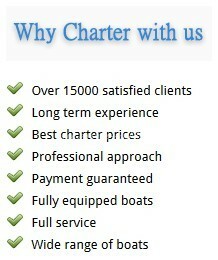 Luxury Motor yacht charter West Mediterranean and Croatia on board M/Y Mim with Europe Yachts Charter. 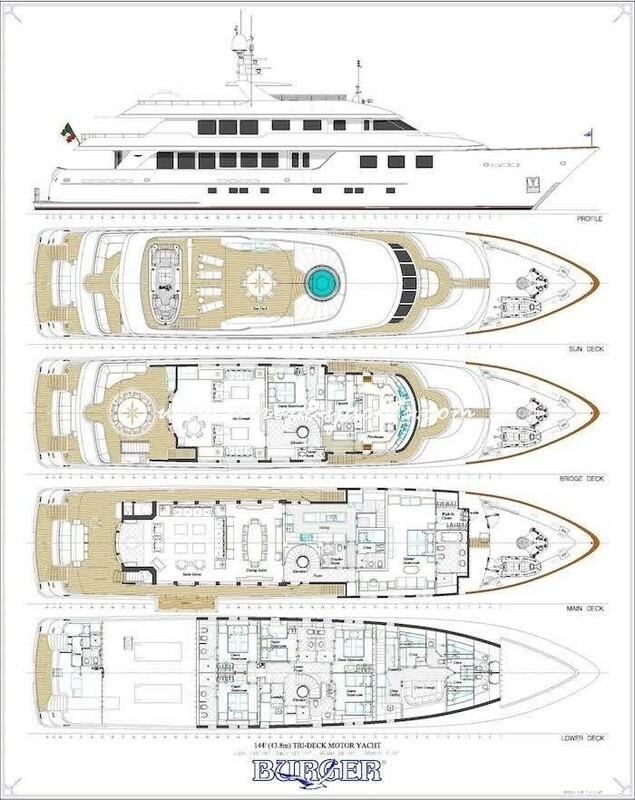 MIM’s stunning interior can be best described as classic contemporary with the extensive use of raised and fielded African Cherry (Makoré) paneling throughout and Amboyna Burl wood accent panels. 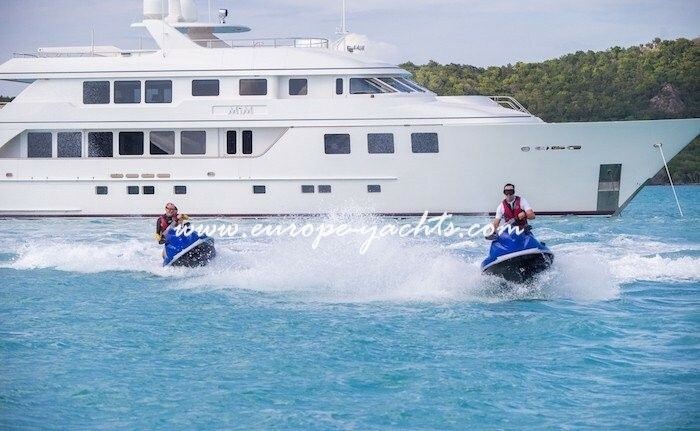 The accommodations include a total of five guest staterooms below deck: three with queen size berths and two with twin berths; one of the twin rooms can be converted to form a king berth. 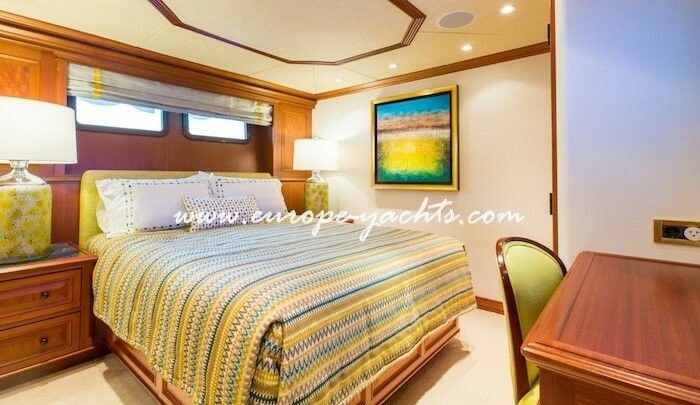 The full-beam master stateroom is located forward on the main deck level and the upper deck includes a VIP stateroom with a queen size berth. 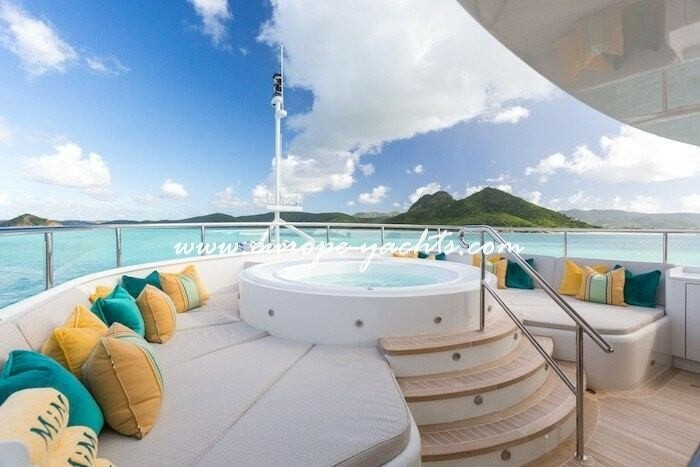 One of the most multi-facetted areas on the yacht is the skylounge. It serves as a spiritual respite, an area for casual entertaining or a home theater setting equipped with reclining seats and a 120″ (3m) retractable theater screen. 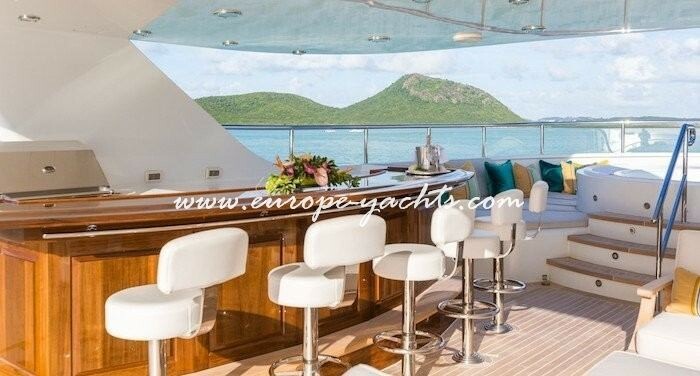 This yacht also features an integrated full-feature CD/DVD system enabling all guests to access the entire A/V library at anytime on demand. 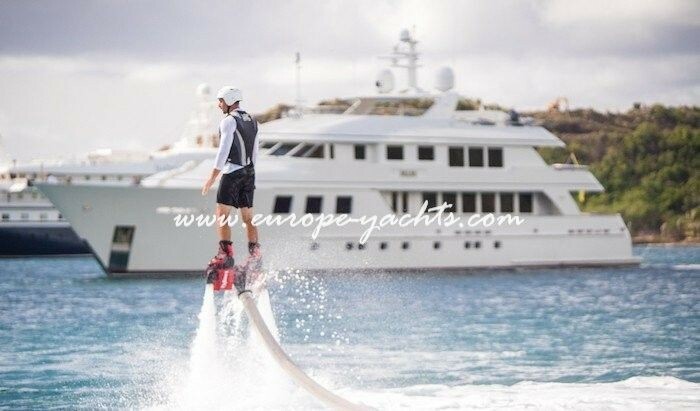 A defining focal point on the yacht is a 40″ (1m) diameter, pneumatic glass-tube elevator surrounded by a circular sculpted bronze and glass stairway with illuminated glass treads spanning all three stories. 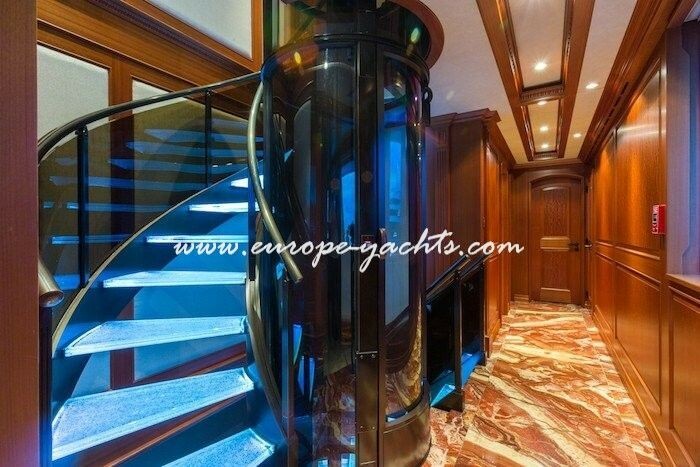 The beautiful glass spiral staircase that surrounds the elevator leads down to the 5 guest staterooms an up to the impressive skylounge, bridge and VIP stateroom. 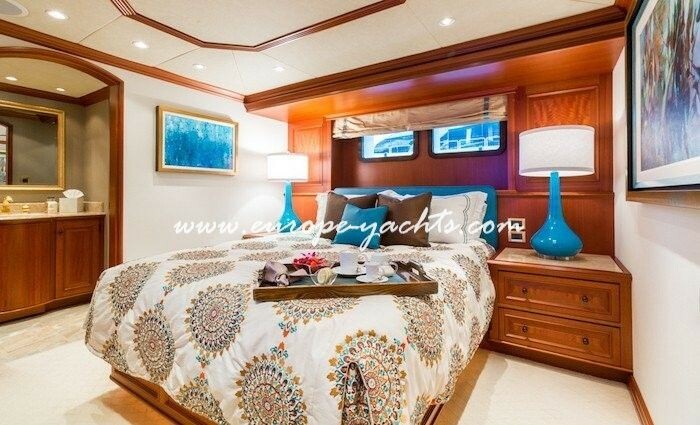 Center-line king size bed facing aft, vanity area to port, settee & coffee table to starboard. 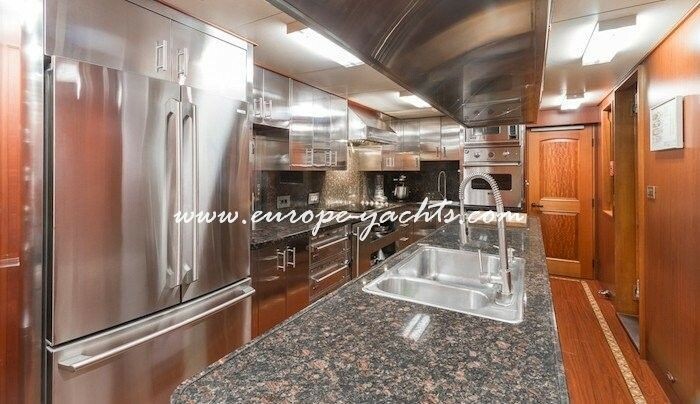 Mirrored walk-in dressing room to port with safe, refrigerator and steam generator for the bathroom and escape hatch. Samsung 32 inch flat screen TV console and stereo center on aft bulkhead. Cream patterned wool-silk carpet with cream and beige suede deck head and dark wood furniture including a leather topped writing desk En suite bathroom with two sinks, Jacuzzi bath, steam/water shower and bidet. Located to port of the upper foyer and adjacent to the elevator. This cabin has a great view and a king-size bed, leather topped writing desk, wardrobe and Crestron controlled flat screen TV. 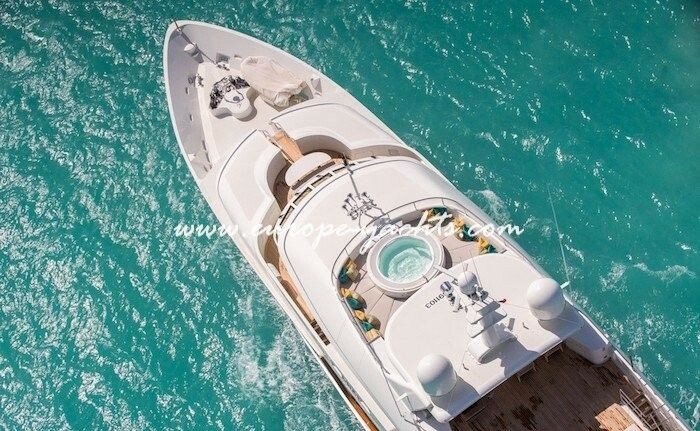 The deck-heads are cream suede and beige silk whilst the carpet is a cream colored wool-silk. The bathroom has a large shower, sink and head. 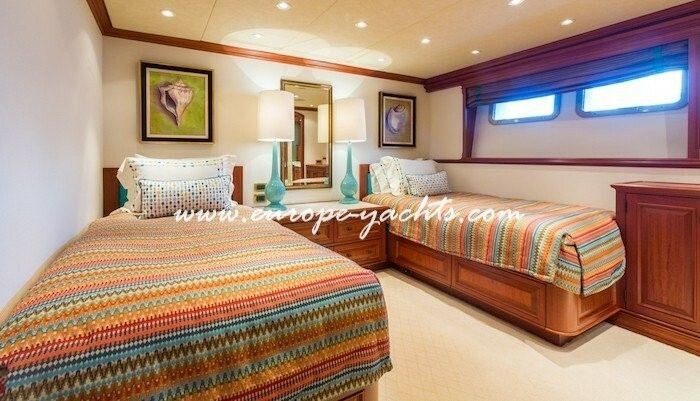 To port and starboard aft as well as forward to port are similar queen bed cabins. Wood and silk paneled walls with fitted wardrobes, lockers and AV system. En suite bathrooms with huge showers, sinks, bidets and head. 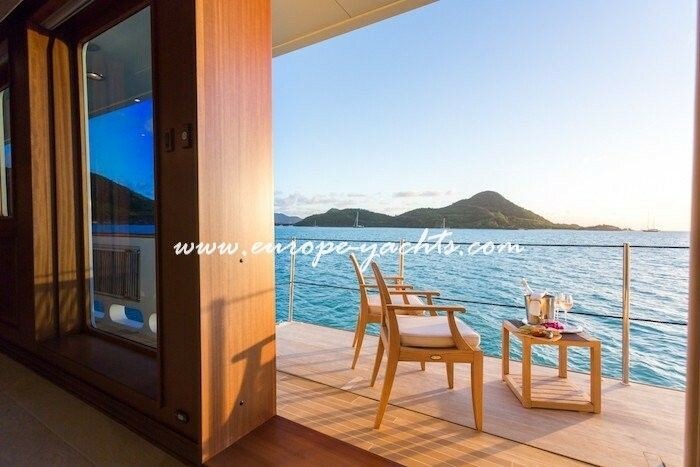 Similar in style to the double cabins, each of these two cabins has twin berths, wardrobes and lockers. 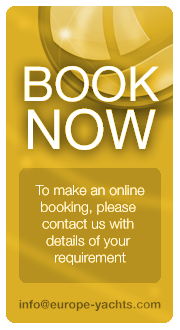 En suite bathrooms with large showers, sinks and heads. 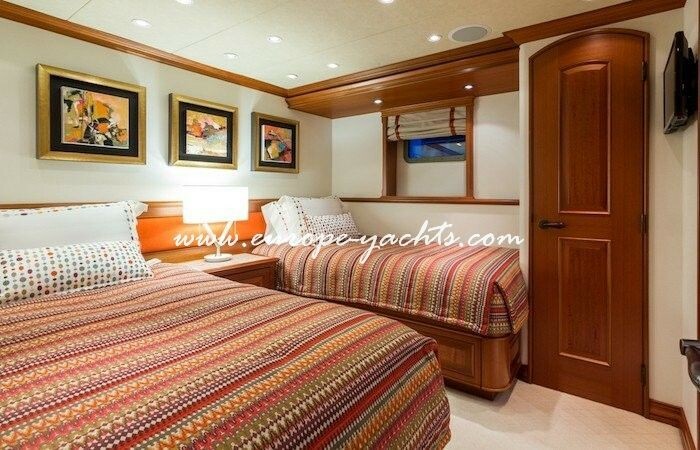 The port midships twin cabin can be converted into a double by sliding the berths together. 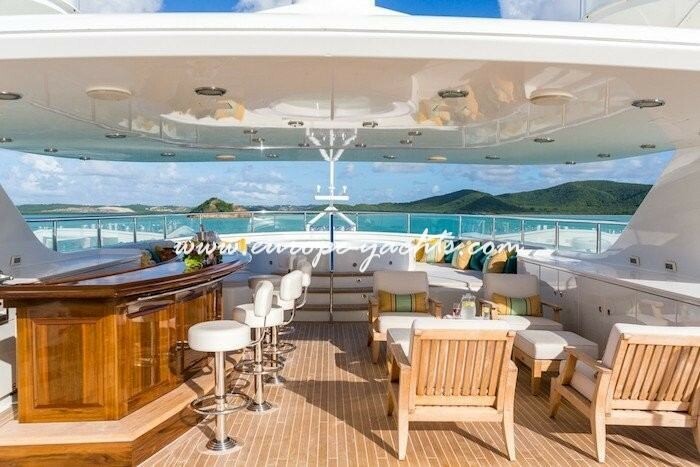 Entering from the aft deck through the circular double glass doors at the aft end is a huge salon with almost full height picture windows. 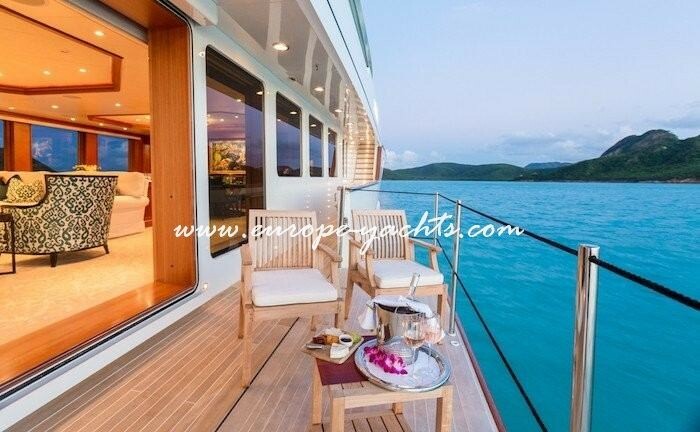 To starboard there is a pair of glass doors opening out on to a drop down balcony over the sea. 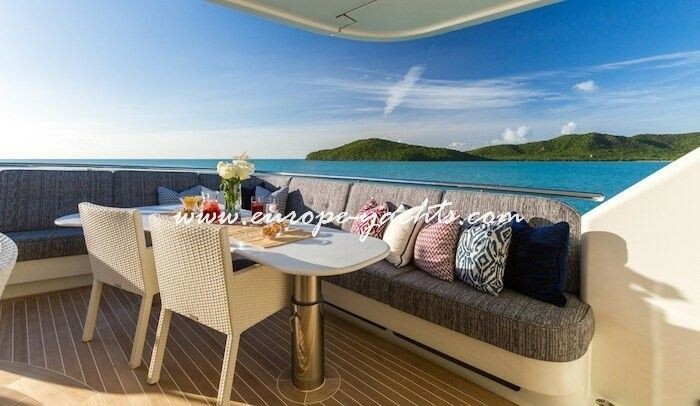 At the forward end there is a large dining table with seating for 12 guests and low height storage cabinets for china, etc. 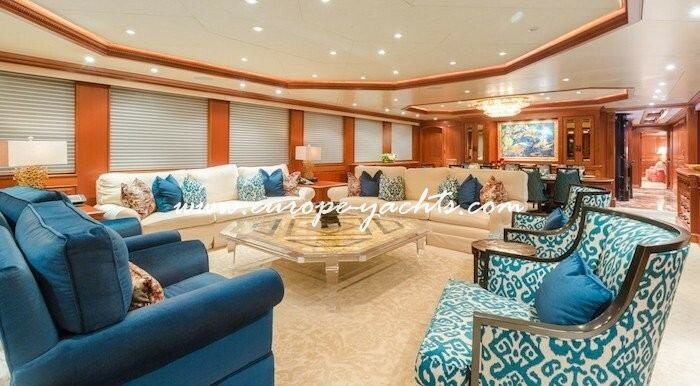 The large main salon has L-shaped couches forward and to port with four comfortable chairs surrounding a large coffee table. This area has African Cherry wood finish on the walls and furniture with traditional detailing. 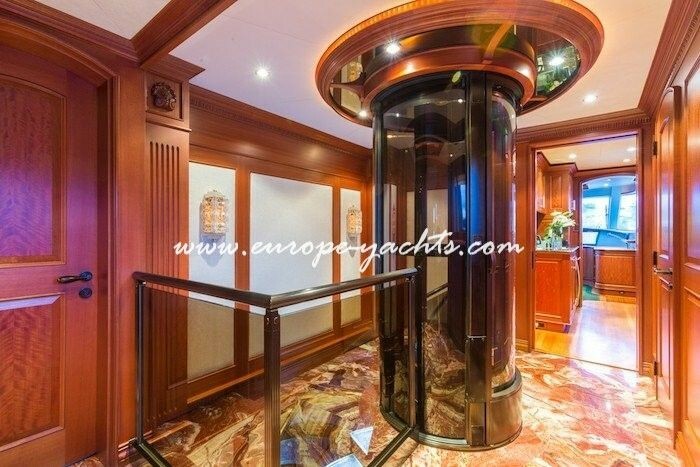 Forward of the dining area is the lobby with elevator and stairs to all internal decks. 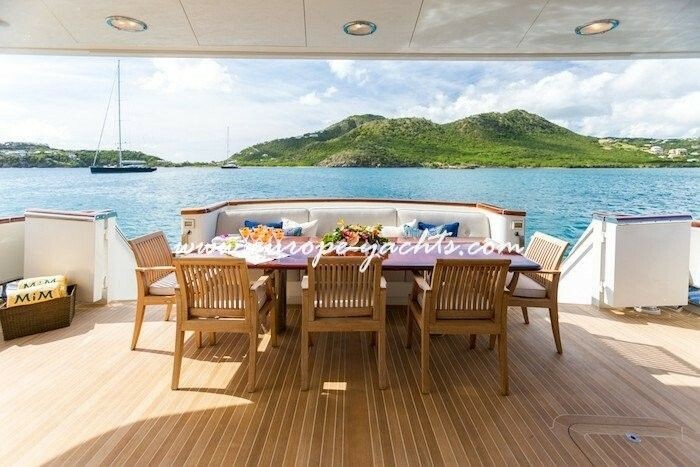 There is a lovely open aft deck with bench seating aft, with teak table and dining chairs and settee for 12. 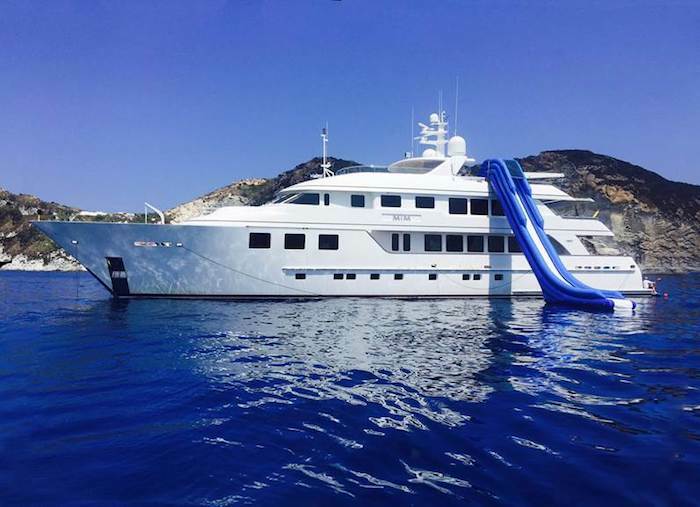 Two staircases access down to the swim platform which has an ingenious and practical. 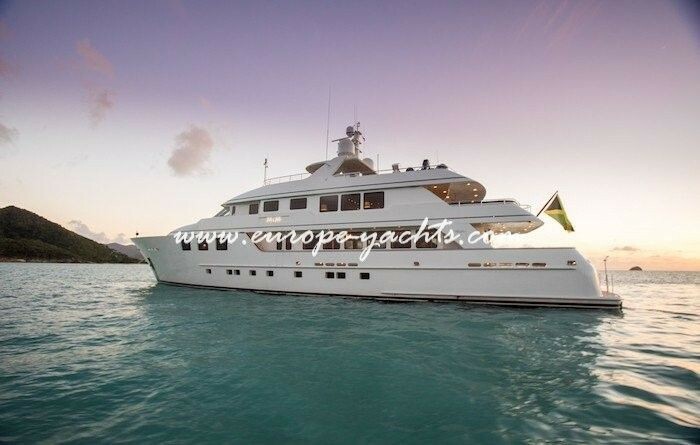 Set to the port side and adjacent to the dining room with large picture windows, walk-in pantry and deck access. 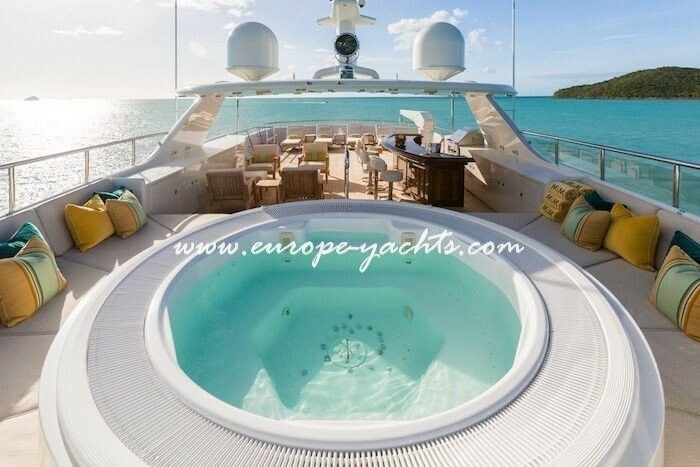 The sun deck has a Jacuzzi forward with sun pads around. 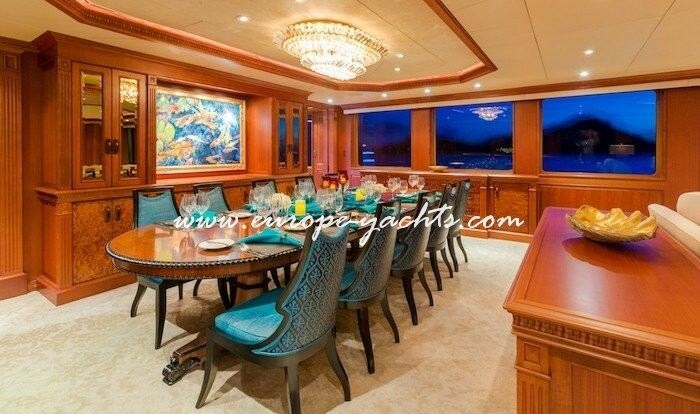 The circular dining table under shaded arch comfortably seats 12 people. 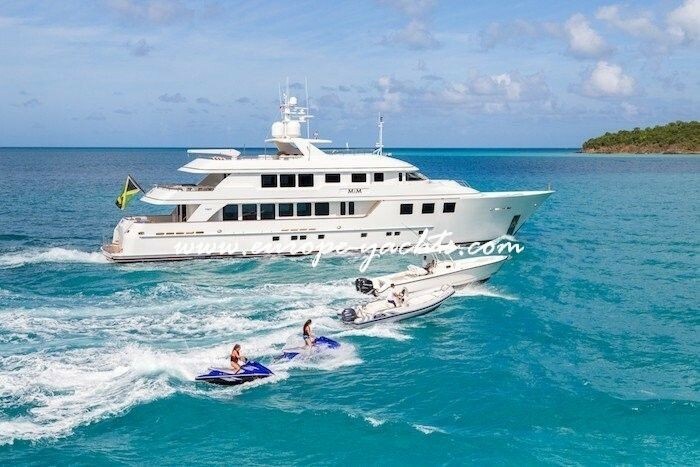 Gas grill, refrigerator, ice maker, sink and wet bar further aft with chaise lounges, and all the way aft is the inflatable guest tender and waverunners. 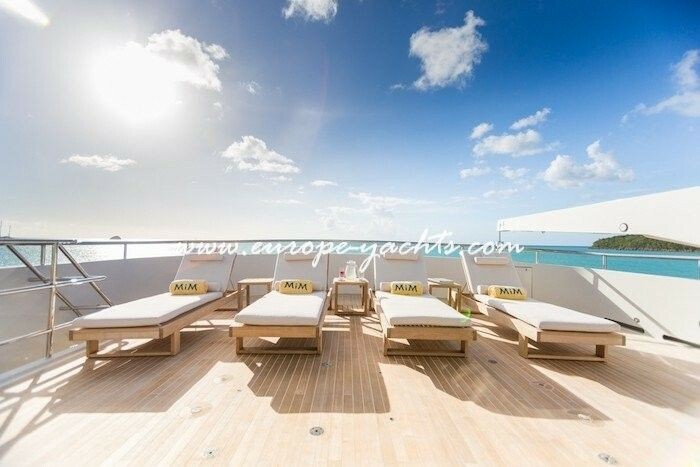 Acres of deck space make this one of the most enjoyed areas of the vessel and a retractable sunroof/hard top and canvas awnings complete the area. An office and computer station is set to port and a chart table is set to starboard and there is forward facing settee with tables. 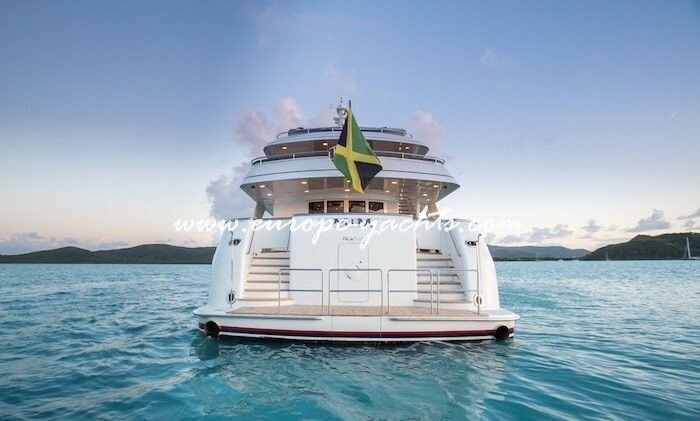 Watertight doors port and starboard with five forward facing windscreens, all with wipers, and two side windscreens. 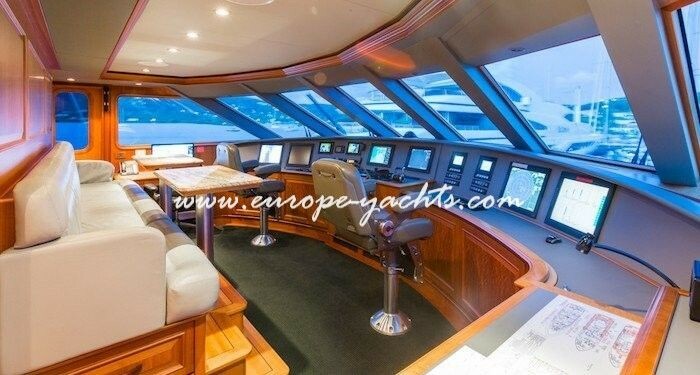 2 x Stidd Helm seats, wing stations outside port and starboard with duplicated bridge controls. 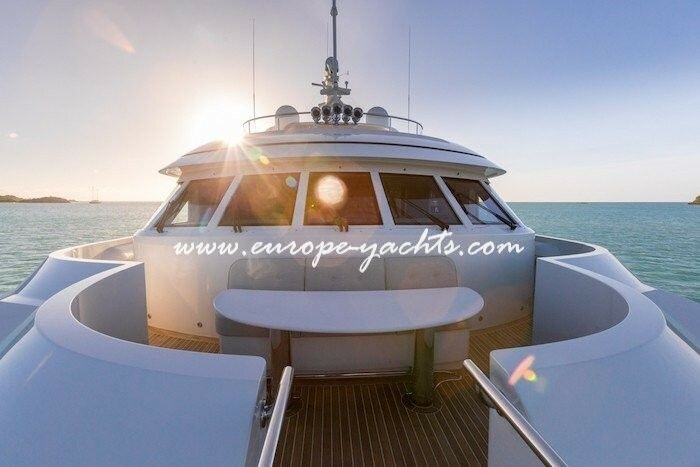 Almost full height windows to port and starboard allow abundant daylight and panoramic views from the upper deck. The skylounge boasts a large 63″ LG TV with surround sound, DVD and stereo system, projector and screen. . 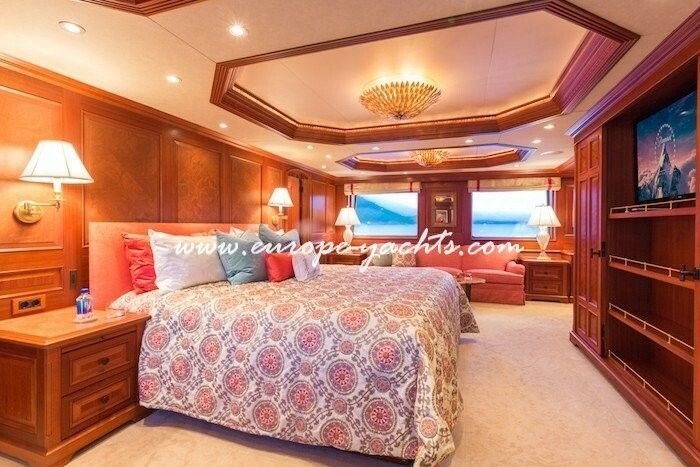 Cream wool/silk carpet with 3-seat settees to starboard, center and port. 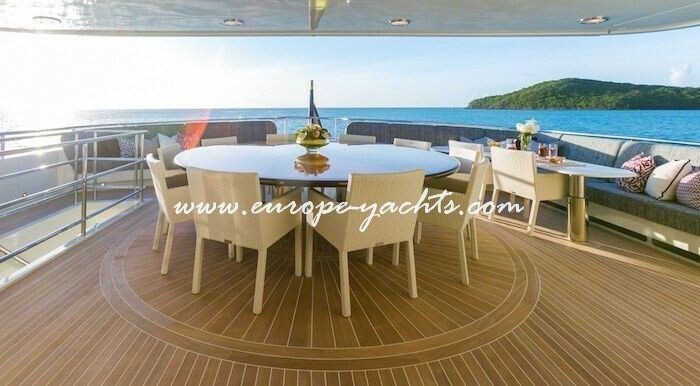 Cream suede and bronze effect emboss deck heads, two glass coffee tables and a card table with 5 chairs and Makore panel bulkheads. The skylounge pantry has dishwasher, ice maker, dumb waiter and coffee maker. Double doors lead out to a large covered dining deck with retractable roof for sun or shade. 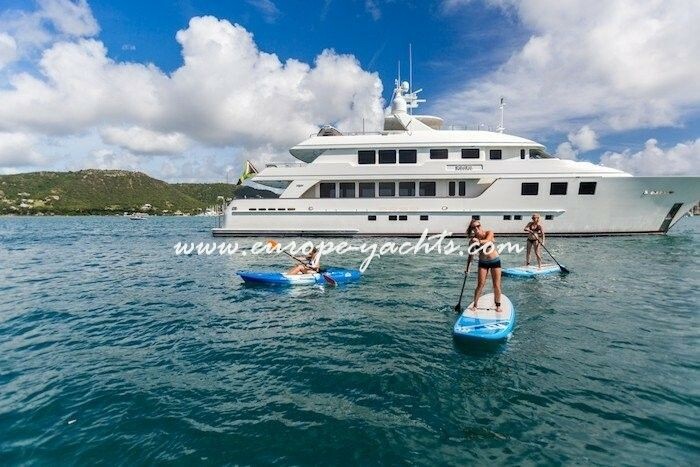 The crew accommodations below deck and forward sleep up to seven in addition to a captain’s suite off of the pilothouse, a crew stateroom for two adjacent to the galley and an engineer’s cabin off of the engine room. 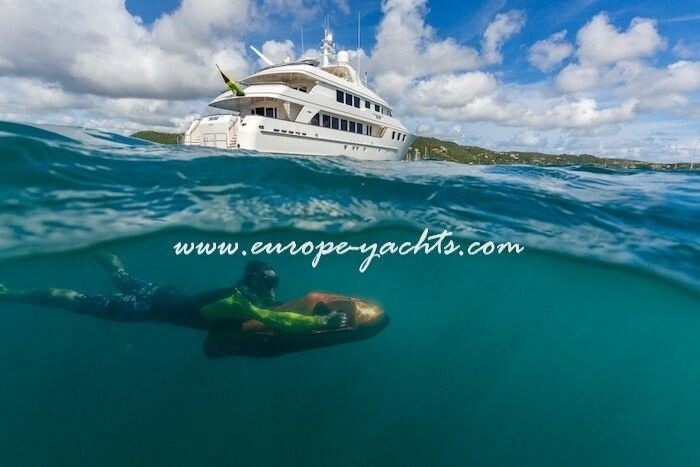 MIM won the Yachts International Yacht of the Year Award in Cannes, France in 2006 after it’s debut at the Monaco Yacht Show.